Converter, 45 W, 220 VAC-110 VAC, P.SUP.32-HQ AC converter 220 VAC to 110 VAC, 45 W.
Voltage converter P.SUP.37-HQ, 300W, 220V - 110V, AC/AC two-way Input voltage converter 230 VAC, output voltage 110 VAC and output current 2.7 A. P.SUP.37-HQ can be used for consumers up to 300 W of active power. List Price 39.00лв. VAT Incl. 37.05лв. VAT Incl. 35.10лв. VAT Incl. 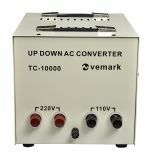 Converter, 1000W, 220VAC-110VAC, TC-1000 Power converter TC-1000, 1000 W, 220 VAC-110 VAC. List Price 99.00лв. VAT Incl. 94.05лв. VAT Incl. Converter, 2000W, 220VAC-110VAC, TC-2000 Step up/down voltage transformer TC-2000 2000W, 220VAC-110VAC from TC series is designed to power household appliances with 220VAC or 110VAC. It is used for such electronic equipment whose nominal AC voltage is different from that of the local network. Transformers are safe to use within the specified parameters. Price 83.30лв. VAT Incl. 79.14лв. VAT Incl. List Price: 119.00лв. VAT Incl. Converter 24V-12V 10A 120W Converter with input voltage 24 V, output voltage 12 V, output current 10 A and power 120 W.
List Price 25.00лв. VAT Incl. 23.75лв. VAT Incl. 22.50лв. VAT Incl. Converter 24V-12V 5A 60W Converter with input voltage 24 V, output voltage 12 V, output current 5 A and power 60 W.
List Price 20.00лв. VAT Incl. 19.00лв. VAT Incl. 18.00лв. VAT Incl. Converter 24V-12V 20A 240W Converter with input voltage 24 V, output voltage 12 V, output current 20 A and power 240 W.
List Price 42.00лв. VAT Incl. 39.90лв. VAT Incl. 37.80лв. VAT Incl. List Price 59.00лв. VAT Incl. 56.04лв. VAT Incl. Converter, 230VAC-110VAC, 100 W, P.SUP.34-HQ Voltage converter, P.SUP.34-HQ, 230VAC-110VAC, 100 W.
List Price 28.90лв. VAT Incl. 27.45лв. VAT Incl. 26.01лв. VAT Incl. List Price 53.90лв. VAT Incl. 51.20лв. VAT Incl. 48.51лв. VAT Incl. List Price 399.00лв. VAT Incl. 379.01лв. VAT Incl. 358.98лв. VAT Incl. Voltage converters convert the voltage value for electronic equipment where the rated AC voltage is different from the local grid voltage. For example from 220 to 110 V which is the standard voltage in the U.S. and Canada. Converters have different power, which must be greater than the power of the connected appliance. Vikiwat Ltd. offers converters from 20 -28VDC to 13.8VDC and provides high power and supply to car stereos, car electronics and other DC appliances.